The unique Kobelco ED150 Blade Runner combines excavator and bulldozer into one multi-purpose piece of equipment. Kobelco ED150 Blade Runner. Is it a dozer? No wait, is it an excavator? You could say it has the best of both worlds. After being imported from America, the Blade Runner was fitted with track guards, ROPS and tilt bucket, for Hiremax Ltd. 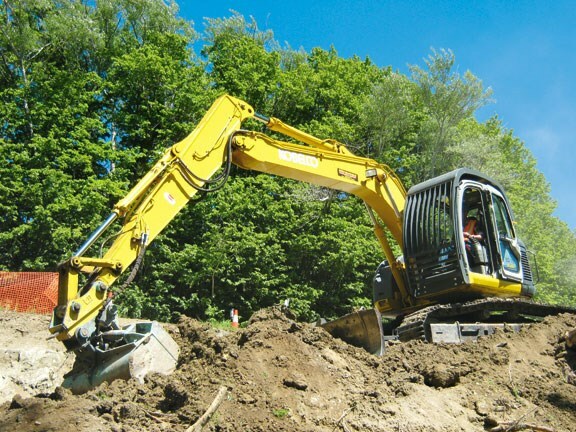 It is built in America and consists of a 14-tonne excavator upper structure combined with a modified undercarriage that is fitted with heavy duty final drives and a six-way power angle tilt blade. A four-cylinder turbocharged Isuzu engine provides 94 horsepower to the four hydraulic pumps. Two are variable displacement piston pumps with a maximum flow of 118L/min each, which supply oil for the main machine functions, while the remaining two are gear pumps. The smallest one delivers 20L/min for the pilot control circuit. 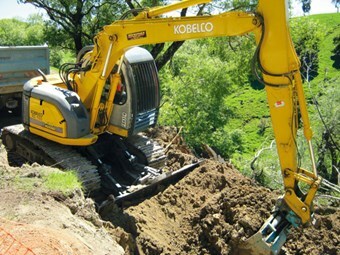 Kobelco fitted a forth pump specifically for the six-way blade functions, which supplies it with 56L/min. The heavy duty undercarriage is from a 20-tonne excavator, although it has been made narrower and shorter to match the rest of the machine. Final drives from a 30-tonne excavator are fitted to boost tracking power to 145kN and increase reliability. Six-hundred millimetre triple grouser curved track shoes are fitted as standard to improve manoeuvrability and reduce damage to delicate surfaces. They tended to be dangerous on side slopes so Hiremax welded on corner grousers to each shoe to provide additional grip. The fully hydraulic power angle tilt blade has a capacity of 2.19m&#179; and a maximum width of 3.25m. This can be reduced to 2.5m for ease of transport by folding back the side wings. The blade and mounting arms are an excellent design; with the blade lifted right up, the mounting arm structure barely protrudes below the huge 525mm ground clearance of the undercarriage. The upper structure remains the same as the standard Kobelco SK135 although it comes with a slightly longer 2.95m dipper arm so that digging depth isn't reduced due to the machine sitting on a higher track frame. Inside the cab there's enough room to get comfortable. Visibility is slightly hindered out the rear window due to the ROPS frame, but a mirror or rear camera would make a huge difference. Controlling the ED150 is the same as other excavators - via two joysticks and two tracking pedals with levers. 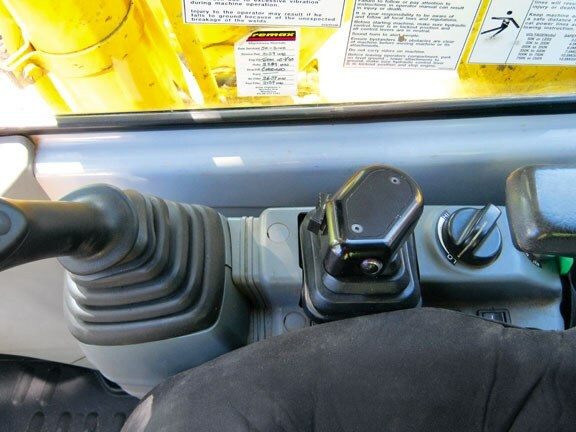 A stubby joystick behind the right boom/bucket one controls the blade function's up/down and tilt, while a rocker switch on the front of the lever takes care of angling the blade up to 25 degrees each way. It is also equipped with a float button and a control lock. On the day of my trial Fulton Hogan had this 2006 model Kobelco Blade Runner on hire to help excavate a drop out on a country road near Masterton. The large six-way blade is definitely no afterthought. Its heavy construction and huge capacity certainly look the part, and mounted on a larger sized undercarriage with 30-tonne class final drives should reduce the chance of failure commonly associated with standard excavators fitted with blades that are used excessively. I begin loading a steady stream of trucks with earth thrown up from an excavator on a bench below. 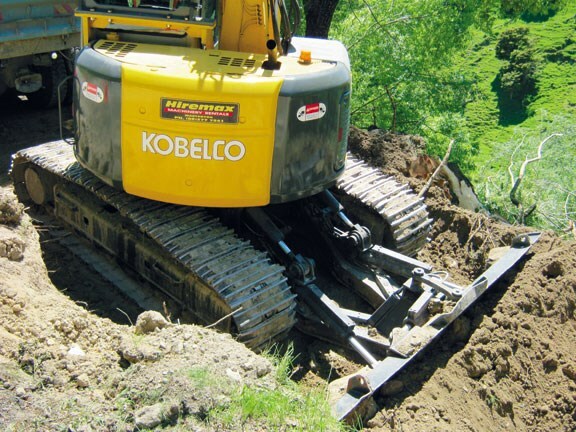 Although the material is already loose, the Kobelco pulls through it with plenty of power. It remained fast and smooth while lifting and slewing to fill the truck. With the blade down during excavation the machine stays very stable though it is still possible to lift a track when slewing at speed with a full bucket. The short blade lever is easy and comfortable to use, and because the blade has its own hydraulic pump performance is not reduced elsewhere during use. The material quickly and easily built up in front of the blade, and even though the blade has a nice curve in it that keeps the dirt rolling ahead, dirt still manages to build up and spew over the back of the 800mm high blade due to the huge amount of traction the excavator achieves. I was very impressed. This high level of traction is helped by the extra weight in the blade and undercarriage, which makes the ED150 tip the scales at 16,200kg as a standard machine. Asking it to push too much results in the triple grouser shoes slipping, although it would be interesting to see what it is capable of if bulldozer-type grousers were fitted. The power angle tilt blade has a wide range of movements and with the upper structure slewed around so the cab is above the blade, visibility is excellent.